I am finishing up renovating my pool and I changed the configuration of the barrier fence I previously had. I now use my house itself as the 4th side to keep the pool deck open (since our kids are grown). The county/state code indicates I must install door alarms on all doors that allow access to the pool (I have 7 due to big sliding doors opening at various points). While I don't agree with being forced to install these alarms in MY house where no children live, I must do so to pass the inspection. I am a do-it-your-selfer and heavily into home automation. 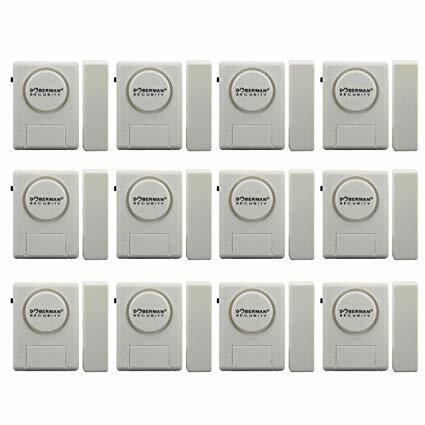 I have my existing home security system, motion and existing door/window open sensors integrated into my home automation system, so I wanted to use this same automation system to meet the pool alarm requirements. I want use a RaspberryPi or ESP8266 Wireless module to handle the override button presses next to each door. Ideally rather than a blaring alarm, I would like a notification sent to my phone or watch. I could setup a blaring alarm just to pass the inspection. I am trying to avoid purchasing seven $50 "official devices" for each door just to pass the inspection. If my DIY system meets the regulations, but is not a UL certified alarm device, will that pass inspection? The alarm sound should last for 30 seconds or more and start within 7 seconds after the door is opened. The alarm should be loud: at least 85 dB (decibels), when measured 10 feet away from the alarm mechanism. The alarm sound should be distinct from other sounds in the house, such as the telephone, doorbell, and smoke alarm. The alarm should have an automatic reset feature to deactivate the alarm temporarily for up to 15 seconds, to allow adults to pass through house doors without setting off the alarm. The deactivation switch could be a touchpad (keypad), or a manual switch, and should be located at least 54 inches above the threshold and out of the reach of children. It is all too easy to ignore texts/notifications/etc. "If my boss/spouse/buddy texts me one more time about that project/trip/party, I'm gonna scream" followed by ignoring the next 30 minutes of little beeps by just swiping them away to look at "later". Kid wanders out...disaster. A new cleaning crew comes in the day before your big pool party. One of them asks, "can I bring my 3 year old, I'll keep an eye on her, she's a really quiet kid" and you say "sure". You go out to pick up munchies. The cleaning person starts vacuuming in the living room. The kid wanders through the door (left closed but unlocked because the crew is cleaning "everywhere")...disaster. You are out at the pool having fun. You hear a honk and go out front to greet the guests. He has the radio on in his car and you decide to listen to the last 2 minutes of the big game, radio blaring, watches/phones ignored (my day off, I'm ignoring texts), kid who was watching TV inside wanders out to the pool to find you...disaster. You can argue whether any alarm is needed. But once an alarm is needed, an App won't substitute. Not when accident to disaster = 3 minutes or less in the water. A number of people have pointed out that for a child even 3 minutes can easily cause major damage or even be fatal. I am not suggesting "up to 3 minutes and everything is going to be just fine" - quite the opposite, I am using that as a very short time period to indicate just how little time it takes - and therefore why an alarm on entering the pool area, hopefully a minute before falling in the pool is vitally important. For those suggesting "put up the stupid alarms and then unplug/remove battery/etc. after the inspector leaves", please don't do that!. Lawyering on whether this rule is really a mandate is probably a waste of time. It's a "best practice" and one easily implemented. Which will create civil and criminal liability for you if you don't implement it. "I'm willing to lump the risk", does your insurance company also agree to lump the risk? I bet they don't. "I don't need no steenkin' insurance", how does your mortgage lender feel about that? You live in a connected society, and you don't get to enjoy the rather enormous benefits whilst shirking the responsibilities. Your pool is an attractive nuisance and Code has laid out a way to deal with that. Ignore it at your peril. Speaking of connected society, you propose to use Arduinos, Wifi routers and smart phones to implement a life safety system. Have you checked with Arduino, Cisco, Google/Samsung, T-Mobile, Comcast and others whose licensed products Will be involved? You can bet they have a very direct and very loud opinion about using their products in life safety systems. Fair chance it is already in their Terms of Service. So involving phones, Arduino or the Internet in the baseline safety solution is out of the question. Again, blatant disregard of those companies' ToS and warnings will only further prejudice a jury in a manslaughter trial, as well as being potentially sued by those companies. They can, however, serve an auxiliary purpose, example being the Ring doorbell type features, where it notifies you of approachers and lets you see them. Unrated home-automation gadgets can also be used for "beyond requirements" purposes. For instance if you have an inner gate which must be protected to Code, and an outer gate which does not, you can do anything you please to defend the outer gate. Safety rated systems hardly need to be ugly. Certainly many suppliers will cheerfully take your money for a no-brain, ugly bolt-on fits-all solution that satisfies statute. But that is not your only option. As long as you do the electrical work to standards, you can certainly apply your industry to a bespoke wiring/installation solution which is concealed and attractive. This is a DIY forum, after all. It certainly won't be any harder than the bespoke home automation solution you are proposing, it will just use different crafts. Generally safety-rated systems just use hardwiring, Underwriter's Laboratories (UL) listed devices instead of Chinese Excrement (CE) junk off Amazon, proper installation methods, and other gold-standard practices. Sticking to gold standard is a liability shield. If you're so smart, why is Code in your way? The last thought I have is the number of people we get in here who fancy themselves "too smart for Code", and yet, for some reason Code is an impediment to them. I cannot point to one single project I couldn't do because of Code. It's nothing more than a speedbump to me. Just do good work that complies. Nothing more to it. Based on your link, I'm assuming you live in Florida. The relevant statutes are 515.29 Residential swimming pool barrier requirements and 515.27 Residential swimming pool safety feature options; penalties. 515.27 list a few options to secure a pool: "In order to pass final inspection and receive a certificate of completion, a residential swimming pool must meet at least one of the following requirements relating to pool safety features:"
A barrier as described in 515.29, but 515.29 (4) precludes this option for you. A swimming pool alarm that sounds an alarm upon detection of an accidental or unauthorized entrance into the water. Such pool alarm must meet and be independently certified to ASTM Standard F2208, titled “Standard Safety Specification for Residential Pool Alarms,” which includes surface motion, pressure, sonar, laser, and infrared alarms. It looks like 4 might be the option you are looking for, no alarms needed. There are less options for self closing sliding doors than swinging doors, but there are some, like the "Door Genie" or "Slideback". If you can't get self closing doors, however, you'll need to get a pool cover or alarms to pass the inspection. If you do end up going with alarms, the statue says nothing about approved alarms. The only requirement is "an exit alarm that has a minimum sound pressure rating of 85 dB at 10 feet". Your homebrew system should suffice if you can prove it's 85 dB at 10 feet. I doubt you'll get any latitude on the code as written. The code is written very clearly. It isn't within the code enforcement official's discretion to set it aside upon request. If there is ever any accident that may have been prevented by alarms per the code, they'd be responsible ethically and legally. I personally think relying on app notifications generated by a home brewed Raspberry Pi based system for anything life safety related is a terrible idea, it just isn't a robust and reliable solution. The Pi is fine for hobby and educational purposes, but not critical applications. I'd recommend reading the actual code carefully and citing the code when discussing the matter with inspectors. Most inspectors are receptive to reasonable, researched discussion. Have you read the relevant county/state code? Have you actually spoken to the inspector about you doors and the required alarms? The document you cite, "cspc-safety-barriers", is a citizen advisory and not a regulation of any kind. Is "cspc-safety-barriers" cited in the relevant county/state code? Did your inspector tell you to follow that advisory? Make sure you understand what you are being told to do before you decide on the best way to do it. Would these alarms be enough? Not sure about shipping to you place, but the 12-pack is listed as $30. The ad mention it is 100db, and have a manual switch. Just place them over the 54 inches and it is done. Since you need a few. You could just pick up some window alarms from walmart - window alarms. I don't know how official they are. They are 120 db and the link shows a pack of 4 for less than $20. Then once the inspection is over and everything has settled down, remove them. Not the answer you're looking for? Browse other questions tagged doors pool home-automation alarm or ask your own question. Which communication bus systems for home automation? What is the most common home automation technology? How can I disconnect power to an ADT alarm system? Is it possible to use a single wire smoke alarm with an alarm system? Can central alarm smoke detectors be used instead of 120v smoke detectors in a new residence?